Its compact size and efficient operating costs is one of the flagship for SOHO users. 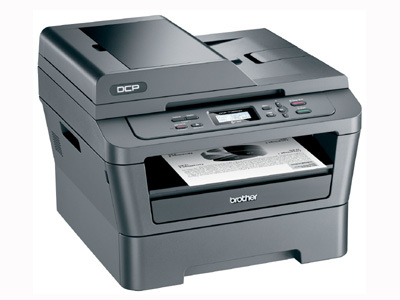 Brother DCP-7065DN able to handle all matters printing to print monochrome laser-based. With the support of Duplex and Network mode, the device is suitable for use as a shared printer that is used on a small scale to medium-sized offices. Lack facsimile function reinforce its use for simpler office activities. Physically, the shape seem compact so practical and not too many consuming places. Simplicity visible on the front. On the front panel there are few buttons so seem spacious. In terms of operating costs, the toner used is able to offer savings with the toner save feature. The device also requires an efficient operating cost of only about 80 pennies per share. Other than through the front panel buttons, Scan and Copy functions can be done via the Control Center application. The advantages of this application is more detailed configuration. While the menu is pretty limited via the front panel, for example, we can not set the preferred resolution. ADF feature can also be used to scan or print via Photocopy mode. When tested, the process of scanning and copying produces lag time is not too distant. To avoid lag when used as a network printer, multifunctional device has been equipped with 32 MB of memory, enough for the use of small to medium sized networks. 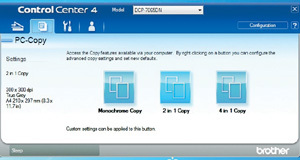 A unique, Duplex function not only can be set via the configuration on Windows only, but also via the buttons on the front panel. As for connection to LAN, users can use the Ethernet port 10/100. You can set the network configuration via the menu on the front panel. The front panel itself uses a text-based two-line display. 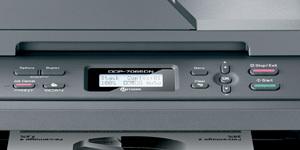 As one line of monochrome multifunction printer, Brother DCP-7065DN offers the advantage of operational at an affordable cost with high performance. With a minimalist physical form, you can place it even in limited space. This function can be performed from the front panel. While the Photocopy function can also be done via the application provided. Activating duplex mode not only be done via software only, but also through the Duplex button on the front panel. Plus: print process hurried; duplex activation and photocopy using two ways; economical operating costs. Minus: The print quality less sharp: there is no toner indicator; paper printouts slightly curved.